Living in New England and particularly on Cape Cod, Cod is plentiful all year long. It is healthful, not particularly expensive and, as noted, ubiquitous in the Northeast USA. So then why haven’t I previously posted any Cod recipes; because Cod, despite its many positive virtues, is basically a bland fish; and due to its flakiness, somewhat difficult to prepare. You can’t grill it, it falls apart too easily. You can’t broil it, it dries out too quickly. You can’t marinate it, it would turn to mush. You could, of course, batter it and fry it, as in Fish & Chips, but that’s too messy for a home cook and besides would stink up the house; no, fish & chips are best left to the professionals. So what can you do with it? You could poach it and serve it with a flavorful sauce, or you bake it and do likewise, but neither of those ideas ever excited me. 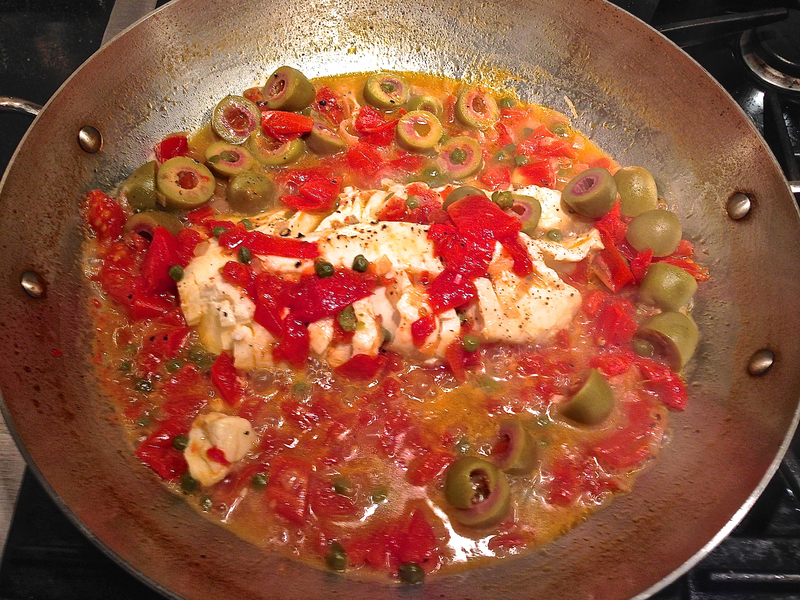 So Cod has been absent from my repertoire, until last night. Inspired by a recipe for Pan-Seared Cod with Mustard Greens that appeared in a local newspaper article sent to me by my friend, Dr. A., in what he refers to as a Rochester (as in Upstate New York) Rocket, I decided to take another shot at the almighty, but troublesome, Cod. Instead of mustard greens, I thought spinach would be a tasty and photogenic compliment, and instead of a light dressing for the dish, as suggested in the recipe, I thought that a flavorful and spiced up fish broth would better do the trick. So, off to the fishmonger for some Cod and clam juice, the latter easier to use as a base for the broth than preparing a fish stock from scratch; then, to the supermarket for spinach and the other ingredients for the broth. Frank’s article mentioned lime juice, soy sauce, ginger and shallots. The soy sauce did not appeal to me and I thought shallots would be too strong for what I had in mind. But I liked the idea of lime juice with ginger, and for a little heat I thought maybe a jalapeño pepper. Finally for a flavorful garnish, cilantro! It worked and it was delicious, particularly with a crusty baguette and a glass of Sauvignon Blanc. 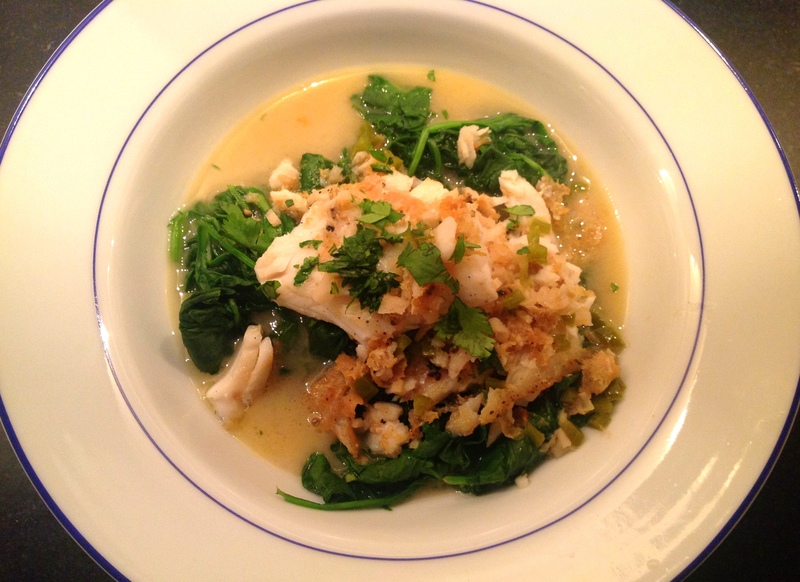 So give it a try at: Pan Seared Cod Served on a Bed of Spinach – Ginger, Lime, Cilantro, Jalapeño Broth. Thanks Frank! A word of caution, Cod being so delicate, should not be flipped. So to cook it evenly, I pan-seared it, then quickly roasted it in a very hot oven…7 minutes in total. The spatula touched the fish only twice, once to gently remove it from the pan and once to gently place it on the bed of spinach.